Raise your hand if you promised to eat better for the new year and so far have missed the mark! Judgement free zone here, you're in good company. First quarter can be challenging when it comes to food. As a blogger, there's this expectation hanging over my head to switch gears to healthy cooking, but fatigue from the holidays is real, not to mention coping with the winter blues (read: eating my feelings.) As much as my intentions were to get back on a Whole 30 compliant meal plan, I am struggling to get back on track. Luckily, I did learn a lot from the Whole 30 journey and even though I've gone rogue, I'm still enjoying a number of compliant veggie dishes. Enter collard greens, which are inexpensive and nutritious, so much so that I eat them every week. I've already shared my recipes for traditional southern style greens as well as a lighter preparation for roasted collard greens. 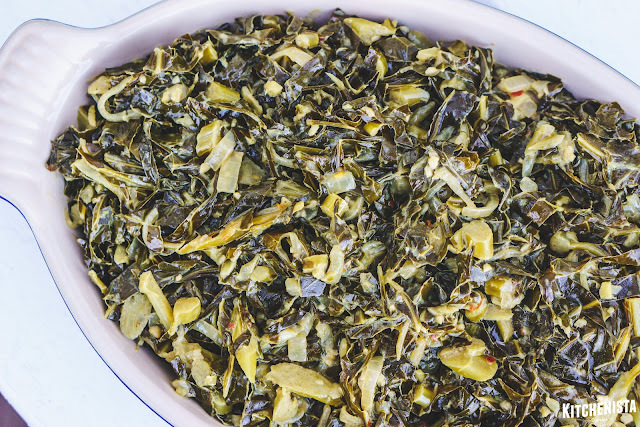 Today I'd like to share another easy way to prepare collard greens and it's very similar to my roasted recipe. My secret? Coconut milk! Braising the greens in coconut milk makes them tender, creamy and ever so slightly takes the edge off their bitterness. I add ginger, garlic, onions and a teeny bit of curry powder for flavor but the main ingredients are really just the collard greens and coconut milk. 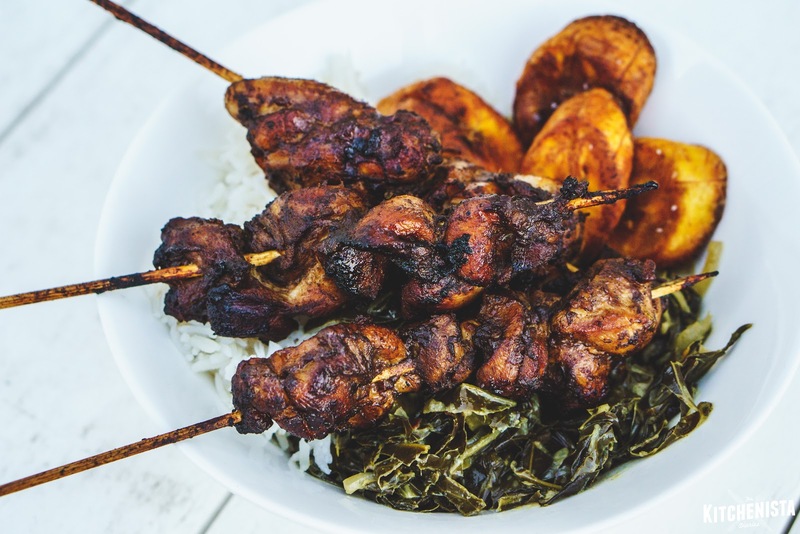 Before we get into the recipe, I'd like to share that I'm one of twenty-eight black food bloggers participating in a Black History Month Virtual Potluck. This isn't your typical collection of southern soul food recipes. Instead, we're sharing all different kinds of foods across the diaspora. From African to Creole, Caribbean to Southern there is something for everybody. 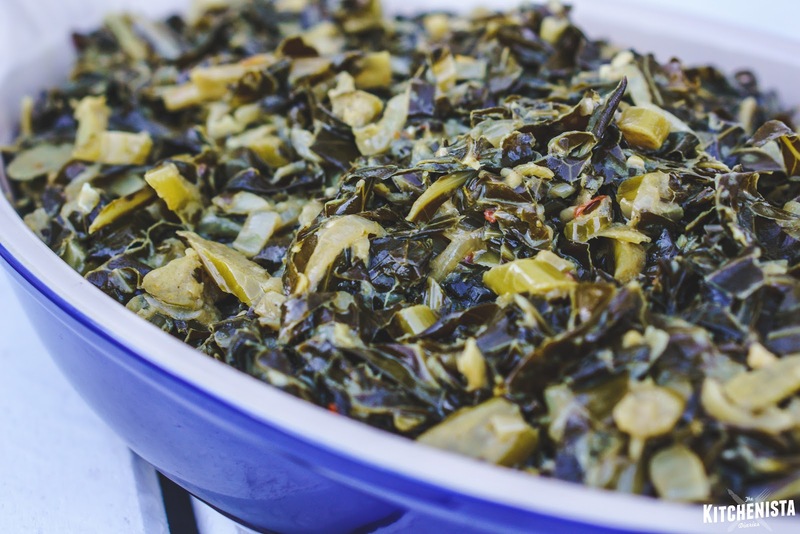 I thought it would be cool to share this version of my collard greens for the celebration since it's a blend of American and West Indian styles of cooking. For each day of Black History Month in February, check out one of these gems below from the amazing black bloggers in our online community! In the pot, melt the coconut oil over medium heat. Cook the onions just until softened, seasoning with a pinch of salt. 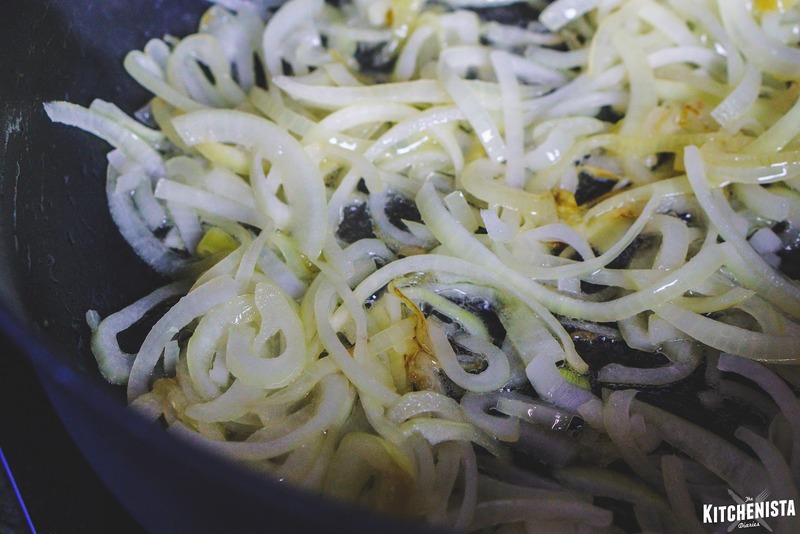 Stir in the garlic and ginger, pepper flakes and curry powder. 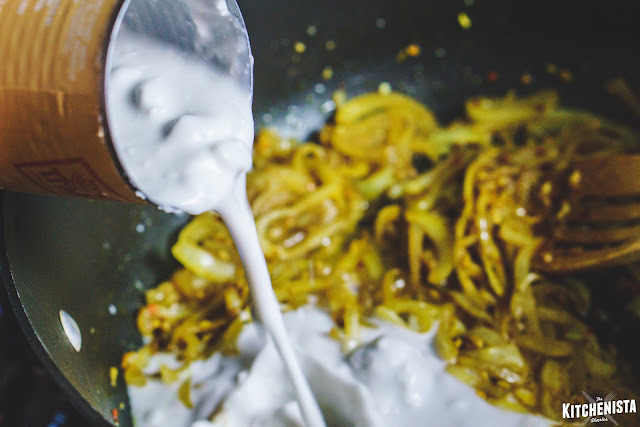 Cook for another minute until fragrant, then pour in the coconut milk. Stir until all lumps are dissolved and allow the mixture to come up to a gentle boil. 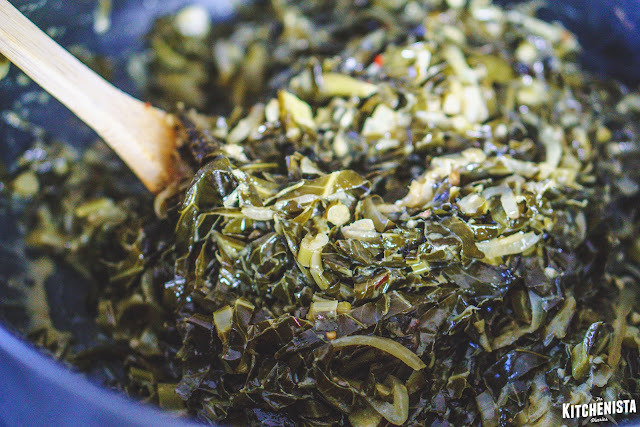 Reduce heat and add the collard greens by the handful. You may need to stop and let them wilt a bit before adding the rest to the pot. Once all the greens are in, cover the pot for a few minutes so they can wilt down completely. Give the greens a good stir to get coated in coconut milk. Season to taste with salt and pepper, then cover again and transfer the pot to the oven for 1 hour. When you open the pot you'll see that the very top layer has roasted and turned a little crispy! 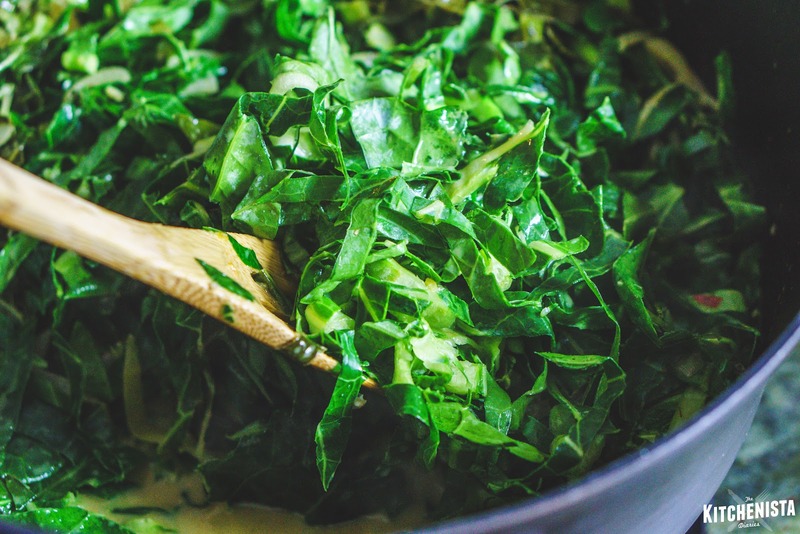 But stir it up, and it gives way to a creamy, dreamy pile of coconut milk braised greens. 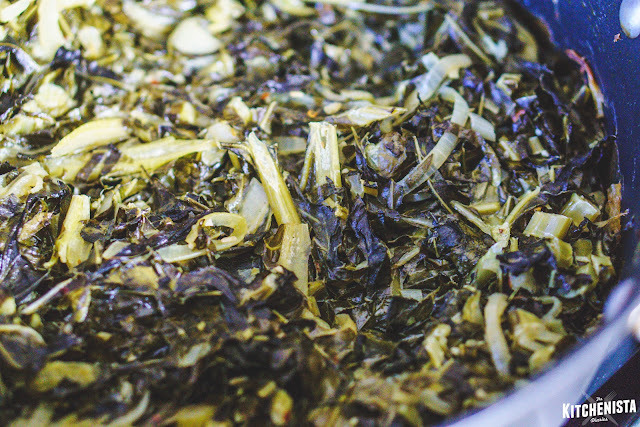 The greens don't get saucy like traditional methods, but they'll melt in your mouth. If you do want a little more of a broth, you can add chicken or veggie stock to the pot before roasting. Finish with a squeeze of lime, and serve hot! These freeze really well so it's a good one to try for meal prep. The last time I made a batch was to serve alongside my coffee & jerk marinated chicken skewers and coconut rice. Yum! Never in a million years would I think to add buttermilk to collard greens! I never cook them because of the bitterness, but I'll definitely have to try this version. This looks SO GOOD. 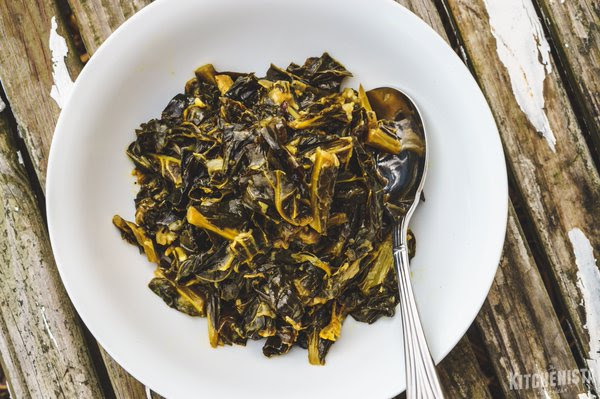 I keep getting collard greens in my CSA share and I was looking for a different way to cook them. I'm going to take your suggestion and make your chicken skewers to go along with them. Can't wait to try your recipes! This looks fantastic! Have you tried Ethiopian gomen? It's a similar dish, and really gorgeous! This is definitely one to try (especially as I happen to have all of the ingredients to hand!). Thanks so much for sharing! Where does the lime fit into the recipe? Thank you. I didnt use the lime either time but this is sooo good! This recipe is soooo freaking good! I made it for the first time last week and I'm making it again right now. I left out the red pepper flakes both times and I'm using two cans of coconut milk because the sauce it makes is incredible. My husband and I tore this up last week! Just made these. I have no words for how delicious they are! Heading to Paypal to send you some financial gratitude. Can't wait to try this! Do you think it could be adapted for a slow cooker? What would you recommend? Do you think adding black-eyed peas would be ok or would texture ruin the dish?